All clinical evaluations, assessments and training are provided by registered occupational therapists who are also NJ licensed driving instructors. A clinical pre-driver evaluation of functional ability, including a simulated brake response, as well as visual, perceptual and cognitive assessments that relate to driving. An on-road behind the wheel evaluation, progressing from residential to highway driving, to assess actual driving behaviors. Driver training for the use of adaptive equipment such as hand-controls, left foot accelerator, one-handed steering devices (spinner knob) and turn-signal cross-over devices. We also provide assistance with your state motor vehicle road test procedure. 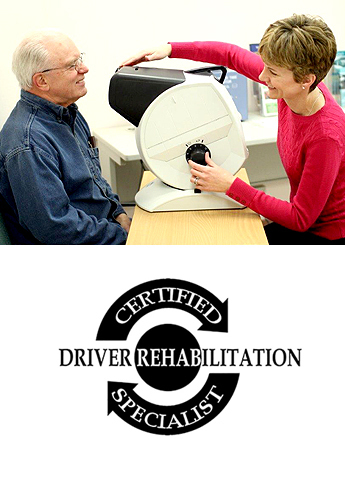 All services are provided by registered occupational therapists who are certified driver rehab specialists. Our driving program and our driving specialists are licensed by the NJ Motor Vehicle Commission (license #20993C), and all on-road services are performed in our specially modified driver training vehicle. We are also an approved NJ Division of Vocational Rehabilitation evaluation and training center. 609-896-9500 x2494 or via email at driver-rehab@slrc.org. To initiate services you may also download, complete and fax our on-line registration forms (below).